Okay, enough fooling around. Let me in. I have terrible follow-through. I'll plan on making something for dinner, but that something often ends up being an entirely different thing. Today I set out on an errand, and ended up going into Pierre Hermé's new shop near Omotesando Station and taking a lot of pictures instead. 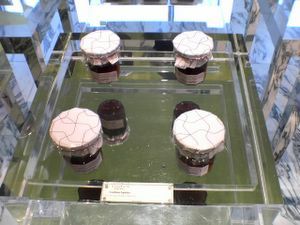 The famed Ispahan macarons - I couldn't get any closer than this without smudging the glass and ruining the pretty view, but here's a slightly closer look. Old Pierre and his confectionaries have been pretty well documented, by both the adoring media and bloggers alike, so I won't blather on further about either. 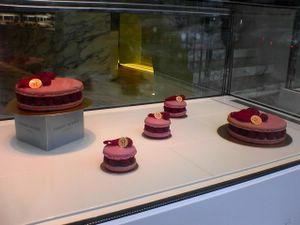 I've noticed though that although everyone's always taking close-up shots of the edibles (an urge I, too, was obviously unable to control), little is revealed of the Hermé shops themselves, the jewel boxes that nestle all those sugary baubles. We-hell, I couldn't let that continue. But first, another display. Closer. And closer. Having just looked at some other Japanese blogs and their photos, I realize the shop assistants are artfully rearranging the pattern of cakes to match the ever-reducing quanitities. I actually visited later in the afternoon, when stock was low, and I now realize how nice it was not to see the usual forlorn white spaces left behind by purchased pastries. It's smart, too, since the remaining goods don't have that "end-of-the-day" taint to them. Um, yeah, back to the interior of the shop. Would you look at that shameless gawker? Oh! 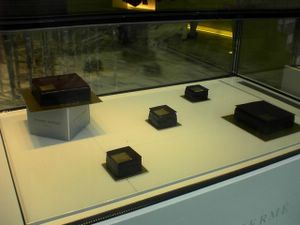 Look at the display cases! The store is newly opened and feels a touch bare, but I do like--whether it is intentional or not--the neat, minimalistic way they've laid out everything. I hate to see desserts crowded together. They always look sloppy and just plain de trop. 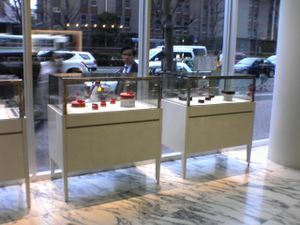 In the Aoyama store I visited today, your eyes travel leisurely, from one case to the next, and the details of each item then receive your undivided attention. What I didn't like was the avocado yellow used in the store--the lighting is understandably focused on the products, but this leaves the wall and door looking a little sickly--nor the rather old-fashioned white marble floor. Also, the staff uniform could have been a little more...something (I think it was white shirt and black pants). So what about tastes? Honestly? I wasn't tempted to actually buy anything (maybe the tricolor Confiture Ispahan did catch my eye, up until my eye drifted down to the price tag). This is an aspect of my self that utterly bewilders my husband: the pleasure I derive from simply looking at food, including its packaging and display. Sometimes I just gaze and think happily, "Mmmm, yummy." But in the case of elaborate cakes painstakingly crafted by highly acclaimed pastry chefs, they always look a bit too sweet, with their lofty layers of mousse and sugary glazes. And so I gawked, I hustled into the store, gawked some more, snapped a whole bunch of pictures. And left, empty handed. I'm getting so used to doing this "looking and not buying (or eating)" crap that I didn't feel the least bit sheepish as I strolled out the unfortunately avocado yellow door. Okay, okay, although I didn't actually think about buying it, I am a big-time sucker for macarons, and I would not ever say no to a Macaron Thé Vert Matcha. These babies are not your regular, ping pong ball sized macarons either, which I suppose is why they cost 420 yen: for those few extended seconds of macaron pleasure. Update: Apologies for missing out some important details. First of all, there is a second floor, a "bar," but one where you stagger after a rough day at work to slug back a Hermé chocolate or two--so much healthier. I approve. 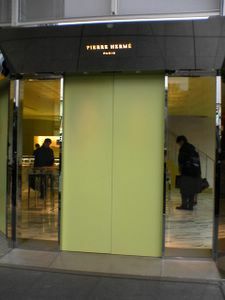 Second, according to The Japan Times, in this short article, Hermé's intended concept for the first floor was a "luxury convenience store." Did he succeed? 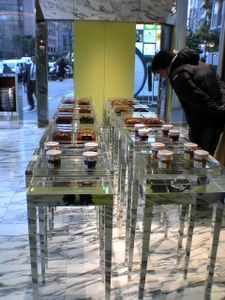 Well, aside from the cakes within the glass cases, the other products--pound cakes, jelly candies, cookies, and jams--felt were very accessible and touchable on their individual glass-bottomed tables. There was even a stack of little silver baskets at your disposal, and I spotted what looked to be a self-service cooler...soon to be stocked with ice cream, perhaps, for that 4000-yen midnight craving? 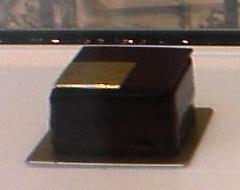 Eh, honey, what time is Hermé opened till? Tempted to try making your own macarons? They are good stuff. There's a recipe at the bottom of the article that is (supposedly) for "Herme's Chocolate Macaroons with Chocolate Filling." Three recipes from the book Desserts by Pierre Hermé -- Autumn Meringue Cake, Chocolate Temptation, Lemon Loaf Cake. Another three recipes, this time from Hermé's book Chocolate Desserts -- Suzy's Cake, Simple Chocolate Mousse, Bittersweet Chocolate Sorbet. 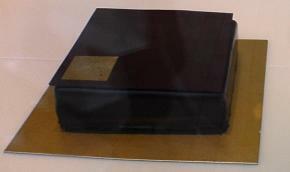 Descriptions of an assortment of Hermé cakes and pastries, accompanied by gorgeous photographs. 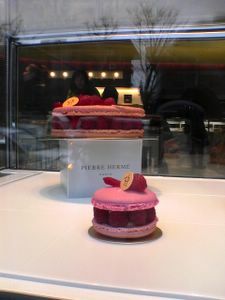 An eGullet member reports on a trip to Hermé's Paris patisserie and the things that were eaten, photos included. Visit the blog of a Hermé insider! In addition to having a scarily incredible resume, this chef used to work at the Hermé patisserie in Paris. Terrific post, and some great links too, thank you Rachel. I know eactly what you mean about looking but not wanting to touch. 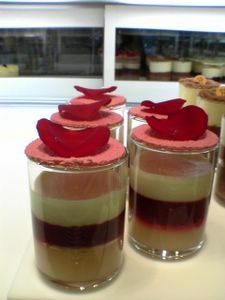 I often find that with elabrate and over the top pastry creations the beauty of them IS in the eye candy. I have found that the taste often leaves much to be desired or it's just not what I had hoped for. I would rather look and remember well than taste and be sorry later. 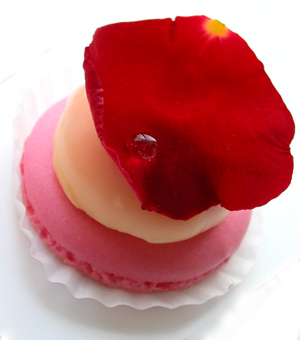 However, I do have a secret desire to one day have at those macaroons...HA! Ohhhhh, I want to go to Tokyo! I don't think I could have resisted that tricolor thingy. Looks beautiful! And the macarons! Thanks for sharing the great photos. Hey everyone, just to let you know, I added an update this morning when I realized I'd completely forgotten to mention something: the second floor of the shop! Hi Deb! Thanks for dropping by. Yes, I'm a simple girl with simple taste buds, usually. 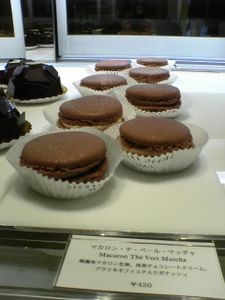 Oho, so there might just be a macaron post some time in the future, hmm? Hi Mariko! I'm so glad you enjoyed the post. You should definitely come to Tokyo and buy the jam, and then let me taste some. Just a bit, just 100 yen's worth. Hi Laura, I'm so pleased you found me. You definitely should still write a review on your store. I'm sure each one has its own unique character and style, and I would love to see shots of the inside of the Paris shop. I simply can't believe you've worked with all those chefs. My mind's still spinning from the "About Me" section of your site! It's amazing that all those macarons are made by hand. I mean, they look so perfect, uniform, and beautiful. I guess that's part of the plan, when they have you churning out hundreds every day. And I don't blame you at all for not wanting to have anything more to do with ispahans. I would absolutely love to go to Paris one day, and I will most certainly look you up...if you're still there! Hey Rachel, I just tagged you for that music meme thing on my blog. Gawking but not salivating (except for the macarons)? That's a first. I am bewildered how you can gawk and gawk, snap and gawk and NOT lust after these confections? Anyway, I've just added the store to my to-go list. Your descriptions sounds divine. Lynn, I'm sorry I went without you! I was truly supposed to be doing something else and never intended to stop by. And you with your impossibly busy schedule, sometimes I feel like I need an advanced booking in order to meet up with you! Hsin-Li, I know I sometimes come across as, um, greedy but I am actually able to say "no" to some things. Keiko, I'm glad you liked the post! Your blog is absolutely beautiful, by the way. I will definitely be visiting when I can. hi to all, I love this blog, I've just moved to Tokyo, gonna be here for a while. Fellow singaporean but thats not the point, you give me hope, that I'll enjoy this place. Having some adjustment issues currently.... sigh anyway i'll be visiting your site daily for my little escape from the city. Hi Julia, welcome to my blog and to Tokyo! Definitely give yourself a little time. It's all a bit crazy at first, isn't it?